Dry Eye Disease is one of the most common reasons that patients visit us at Eyes On Brighton. The most common form of Dry Eye is Evaporative Dry Eye, affecting 9 out of 10 people suffering Dry Eye Syndrome (86%).1 Evaporative Dry Eye is often caused by blockage of the oil glands in your eyelid (the Meibomian Glands). Meibomian Gland Dysfunction (MGD) leads to the tears evaporating faster than normal due to a shortage of oils in your tear film. Proper treatment of Dry Eye Syndrome involves much more than just artificial tears. Eye drops usually relieve your symptoms but this is only temporary. Without proper treatment, inadequate tears can make daily activities frustrating or, in some cases, debilitating. Patients find that their personal and professional lives are affected and have difficulty with activities like reading, watching TV, driving and even socialising. With the increased use of digital devices, the prevalence of dry eyes is also increasing. Worldwide, over 300 million people have have been diagnosed with dry eye. Many people who suffer from Dry Eye Syndrome find that the underlying cause is from blocked meibomian glands. These blockages inhibit the natural production of the lipids (oils) which act as a protective barrier which sits on the surface of the watery layer of your tears. Without these oils, your tears will rapidly evaporate and you will exhibit the symptoms we normally associate with dry eyes. Understanding the root cause of your dry eyes is essential to proper treatment. Common symptoms of dry eyes include itchiness, a burning sensation, watery eyes, grittiness — a feeling like you have sand in your eyes, sore or red eyes. You may also become more susceptible to the negative effects of certain environmental conditions such as dry climates, air conditioning, or windy gusts. Normal tasks may also become difficult, such as computer use, reading, watching TV and even normal socialising, such as making eye-contact. These symptoms can have very negative consequences on our daily lives and can quickly become debilitating. There are also dangers to the long-term health of our eyes. One of the most common causes of dry eyes is improper blinking. The increased use of digital devices has contributed to a significant increase in infrequent or partial blinking. 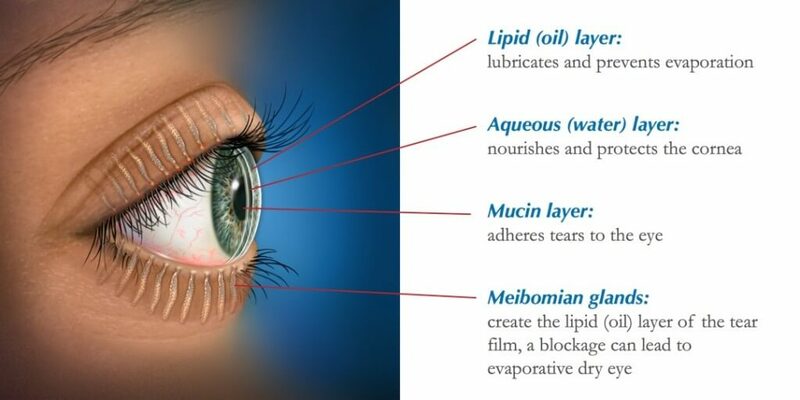 The physical act of blinking stimulates the meibomian glands to secrete oils, which results in the proper spread of the protective lipid layer across your tear film. Partial blinking does not create the full pressure required to release these oils. Meibomian glands can become blocked due to environmental factors, infection (bacterial or demodex) related to belpharitis, dietary factors (insufficient hydration or omega-3) or even damage to the glands. Blockages to the glands will result in hardening of the oils over time, which will become worse if left untreated. Unblocked meibomian glands will eventually atrophy, or die off. When the glands reach this point, they cannot be regrown and the symptoms of dry eye will become much worse. At Eyes On Brighton, our goal is to detect and treat the underlying causes of your dry eyes. After a comprehensive dry eye assessment, we will create your dry eye treatment action plan. 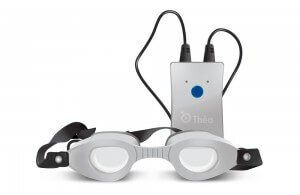 This may include one or more treatment options utilising the latest technology in dry eye care: Blephasteam goggles, Intense Pulse Light (IPL) and Lipiflow. We may also perform meibomian gland expression to unblock your glands in order to bring the flow of natural oils back to proper consistency. An important component of your dry eye treatment action plan will be the recommendation (if required) of lifestyle changes, dietary changes, supplements, specific eye drops and consistent use of at-home, warm compress products, such as the EyeGiene® Insta-Warmth System or the Bruder Eye Hydrating Compress—all of which are available for purchase in our clinic. Intense Pulsed Light (IPL) generates a polychromatic pulsed light via a series of calibrated and homogenously sequenced light pulses to stimulate the Meibomian glands in order for them to return their normal function. 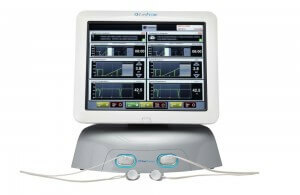 LipiFlow® is a procedure designed to treat the root cause of Evaporative Dry Eye, blocked Meibomian glands. LipiFlow® works by applying directed energy to the eyelid near the affected glands—precisely targeted warmth from the back of the eyelid, and slight pressure from the front. Blephasteam® is an eyelid warming device which delivers consistent and standardised latent moist heat therapy to provide an environment that naturally enhances tear quality thus improving ocular health, vision and comfort. 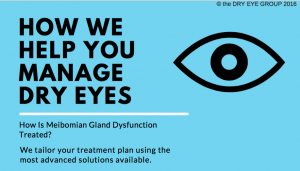 Click to see the many ways we treat dry eyes at Eyes On Brighton (member of The Dry Eye Group). 1 Lemp MA, et al. Distribution of aqueous deficient and evaporative dry eye in a clinic- based patient population. Cornea. 2012 May;31(5):472-8. Disclaimer: This article is for information only and should not be used for the diagnosis or treatment of medical conditions. 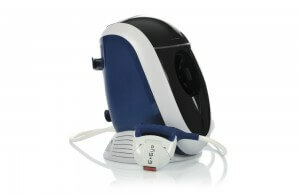 Eyes on Brighton has used all reasonable care in compiling the information but make no warranty as to its accuracy. Please consult our optometrists, or other health care professional for diagnosis and treatment of medical conditions. Eyes on Brighton offer Blephadex wipes for dry eye treatment at our Brighton clinic, helping locals manage their condition even at home. Allowing you to clean your eyelids and soothe your dry eyes, Blephadex wipes are invaluable for dry eye sufferers. If you have been looking for easy, at-home dry eye treatment in Bentleigh, Hampton or surrounds, Blephadex wipes are likely to be a soothing solution. Simply visit Eyes on Brighton for Blephadex products.